We've done our best to make all the elements of the Gifts of Heaven package accessible to everyone who would like to put them to use. Many of these files are quite large and many require specialized software, so please read the notes regarding each file carefully before starting the download. Adobe InDesign CS2 package: Includes all original graphics and photographs. This is the most complete and versitile package and the download we recommend if you have access to Adobe InDesign CS2. QuarkXpress 6 : The images/graphics are a composite pdf document placed in the background, but all type elements are editable. Microsoft Word : These files are recommended only if you don't have access to either of the previous software packages mentioned. All type elements are editable, but the graphics/images are a composite image. Adobe Acrobat (PDF) : These are print-ready files, but are not editable and are available in English only. PowerPoint: The same PowerPoint template file that's being distributed in the Gifts of Heaven package is available here for download. See a description of the file here. 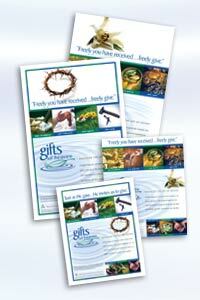 Gifts of Heaven Logo Files: Includes a selection of the most popular file formats. We encourage you to use the vector artwork if at all possible, especially if you plan on printing the logo at a large size. Transcripts of video testimonies: All of the personal testimonies from the DVD presentation in a single MS Word document. Stewardship Quotes: A collection of powerful statements from a variety of sources on the subject of Christian stewardship collected in an MS Word document.